"The selection of music covers a lot of ground. Spanning several continents, the CD includes works from a wide mix of heritages: Spanish, French, Norwegian, American, Polish, and Czech. One of the American pieces showcased, “The Deserted Garden,” by Florence Beatrice Price (1887–1953), is worthy of special mention. Price was the first African-American woman composer to have a symphony performed by a major orchestra. Her piece is performed with considerable finesse as the musicians capture the melancholy beauty of Price’s work particularly well. 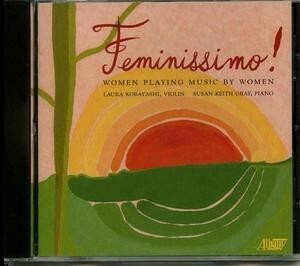 This CD is the 2nd collection of works by women composers for violin and piano recorded by the Duo. The disc features four world premier recordings among the nine works presented. The Duo chose a wide variety of styles and nationalities for both recordings. Feminissimo! is a mixture of romantic and contemporary character pieces and sonatas written by composers of Spanish, French, Norwegian, American, African-American, Polish, Czech and Jewish-American heritages. The four premiere recordings are works by living composers Elisenda Fábregas and Emma Lou Diemer and by early 20th century composers Anna Priscilla Risher and Signe Lund. Other works include those by Grażyna Bacewicz, Florence Price, Meira Warshauer, Pauline Viardot-Garcia and Vítezslava Kaprálová .